Stay up-to-date on our press releases, events and general corporate news! Casco Manufacturing Solutions will be exhibiting or attending the following trade shows. Casco Manufacturing is a Semi-Finalist for the 19th Annual Goering Center Family & Private Business Awards. Wanted: Nimble-fingered industrial sewing operators with good work ethic. Training provided. If all American corporations that off-shored manufacturing suddenly re-shored, the American economy would suffer from a massive labor shortage. 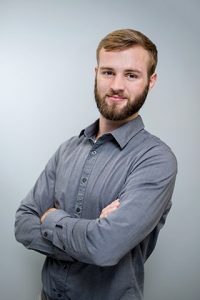 Nathan Bare of Miamisburg, an industrial engineer at Casco Manufacturing Solutions, has been named a Rising Leader for the month of July by the Goering Center for Family and Private Business.